300 million people suffer from osteoarthritis all over the world, a figure that has doubled in the past 30 years affecting also the younger population. Obesity, aging, and sports as running or football are among the main causes of this increase. In Spain, the osteoarthritis creates an annual expense of 4.738 billion euros. Management and health policies still do not give an adequate response to the needs of patients. Santiago Niño-Becerra, with a masterclass called: “Liability: the new requirement of social protection”. Venerable Thubten Wangchen, a Buddhist monk and founder of the House of the Tibet in Barcelona, will give a talk about “How to be happy in everyday life: we have potential to transform and accept our pain and suffering in positive to increase our happiness and peace”. Tomás Molina, head of meteorology of TV3 will answer to the question “Why our joints hurt when it rains? Other activities: outdoor Tai Chi session, ultrasound measurement of joints condition, evaluate joint movement, among many other practical workshops. 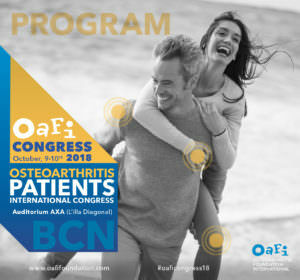 WE ENCOURAGE YOU TO ATTEND THE 2ND INTERNATIONAL CONGRESS OF OSTEOARTHRITIS PATIENTS! The event will be free and will take place on the 9th and 10th of October in the Barcelona Auditori Axa (L’illa Diagonal).